The lecture was presented at the Komitas House of Chamber Music. 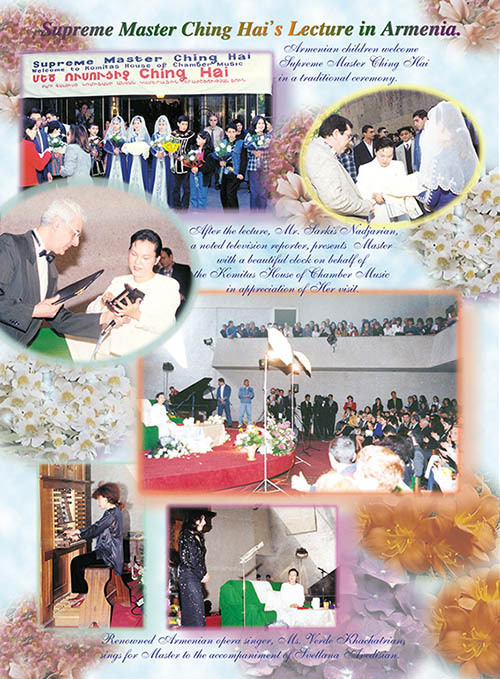 The main auditorium and balcony were filled and the aisles held the overflow of the crowd. Children, dressed in traditional Armenian costumes, respectfully stood in front of the entrance hall to welcome the Supreme Master in the traditional manner and then escorted Her through the hall and onto the stage. Master hugged these lovely children and gave them candies and red envelopes that contained lucky money. Master, captivated by the beautiful buildings in Armenia, commented that the people of their ancient civilization were able to match very different colors in constructing such magnificent palaces because of the power of their tremendous inner spiritual energy. 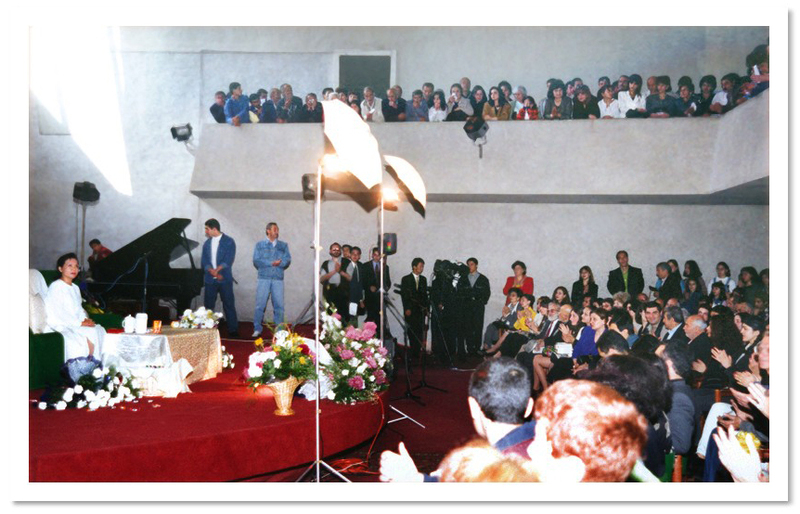 Thanking the people of Armenia for sharing their treasure with the world, She pointed out that God likewise had ordered Her to share the spiritual blessing that Hes has bestowed upon Her with the people who would like to know. God has commanded Her to go out into the world wherever requested to give this message: "God loves you very much and if you want to see Hirm, I have to show you the way." As Master spoke, the audience members listened attentively and frequently expressed their appreciation and understanding by resounding applause. During the question and answer session, someone asked Master if She had seen God and if so, what does Hes look like. Master replied that God appears in whatever form we want. "God has two attributes: form and formless. And even within the attribute of form, Hes has two forms. If Hes wants to materialize in this world, Hes becomes like this. [Master pointed to the people in the audience.] All of these are God's materializations. That is why the Bible says that God dwells within you." Laughingly, Master said, "It's really funny how you don't know that you are God. And there's another form, an invisible form in which God also manifests to communicate with you when you meditate within. That is a little higher level. In the highest level, God is formless; God is only bliss, light, happiness, and indescribable ecstasy - indescribable! And when you see the invisible form of God inside, you feel so exalted that you don't know what to do! In the Bible, it is said, In my Father's house, there are many mansions. That means there are many different attributes of God that we must know one by one." Another person's comment that he thought Master's presence in Armenia was a great event drew thunderous applause from the audience. After the lecture, Mr. Sarkis Nadjarian, a noted television reporter, presented Master with a beautiful clock on behalf of the Komitas House of Chamber Music in appreciation of Her visit, and by arrangement of its director Mr. Robert Sahakian, the famous Armenian opera singer and recipient of the International Music Award, Ms. Vardue Khachatrian sang two songs dedicated to Supreme Master Ching Hai, "Ocean of Love" and "Suma Ching Hai." The next evening, after a press conference, Master took part in an occasion entitled "Musical Art - an Evening of Love" convened by Ms. Nadezdha Sarkisian, Congresswoman of Armenia and President of Hayer Cultural Foundation, together with the Sharm Company. After the evening's event, Master met with the new initiates to satisfy their intellectual queries and their longing to be with Her longer. An elderly lady told Master that she had been a doctor for 45 years but now was displaced from her home. Master said She was very sorry that this late in her life she has to go through all this and that She understood her feelings because She was also a refugee. Master continued to say that we are all refugees in this world because this is not our real home, but rather we should seek always to return to our eternal Home and there we will always be at peace. Later, Master taught the new initiates the Holy Names and meditated with them for a while, and when the initiates were deep within, She quietly took Her leave.